Raymond Lam (林峯) announced that he has left EEG and signed under Louis Koo‘s (古天樂) manager, Ronnie. Raymond said it was an easy decision as he has been good friends with Ronnie for over 17 years. Although Raymond is no longer managed by EEG, he maintains good relations with his former company and appears in the EEG-Youku-produced web drama, Police Tactical Unit <PTU機動部隊>. Appearing as an undercover cop, Raymond is happy he gets to fulfill his childhood dream of being a police officer. 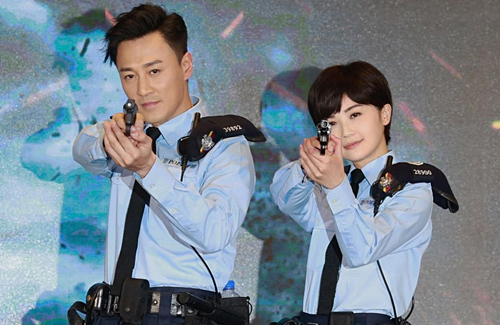 Police Tactical Unit also stars Charlene Choi (蔡卓妍), Alex Fong (方中信), Louis Cheng (張繼聰), and Patrick Tam (譚耀文). Focusing his career in Mainland China in the last five years, Raymond is happy to be filming in Hong Kong again and be able to speak Cantonese on the set. Well I’m glad he’s out of EEG’s clutches. Looks like they haven’t been working that well for him given his mainland career has basically been stalled since he’s left TVB. It’s quality over quantity – and the projects they selected for him were all pretty craptacular. I don’t think I’ve watched a single successful one yet. May be his projects were craptacular, but he himself – his acting – is crappy too. He thinks himself is a superstar, but he is not even close. He overrates himself. @lewismcchan he used to be good back when he first started, i.e, Twins of Brothers, Eternal Happiness, even A Step Into the Past (he was rougher in there, but still had heart.) nowadays it does seem like he coasts along his reputation and ‘chok’ face rather than heart and talent. but I still have faith that if he meets the right project, he will shine. is he even popular in mainland? ever since he left HK & TVB the only news about Ray were his relationship with Karena and not much about how well he’s doing with his career. Anyway goodluck Raymond! Even if he was, it would not be reported here. Signing with Ronnie may open up more film opportunities for Raymond Lam. As he’s older now, it looks like Raymond is more interested in quality over quantity. Filming dramas take too much time. EEG tried to manage Raymond like an idol, but he’s already now 38. I think it’s the right step for him to try more mature projects.